The U.S. Army Corps of Engineers built the Alaska Highway during World War II with the easiest route possible. The result is an pretty boring drive. WC strongly prefers the Cassiar Highway, which breaks away south from the Alcan just before Watson Lake and runs 450 miles to the Yellowhead, Canada Highway 16, about 150 miles east of Prince Rupert. The Cassiar is far more scenic. 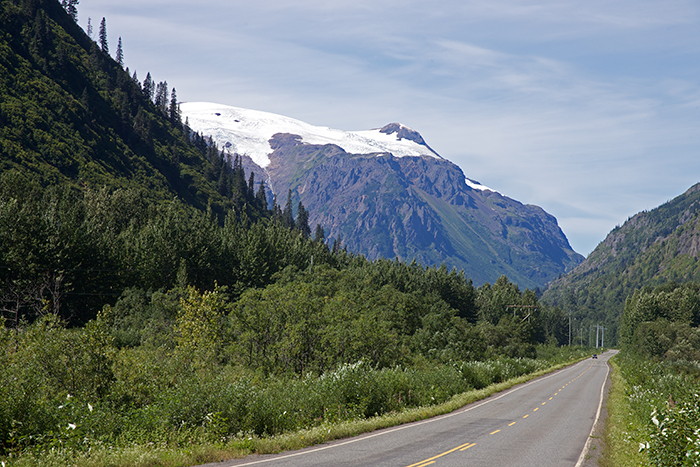 And it gives you access to the Stewart-Hyder Cutoff, one of the more amazing drives in Alaska. Not only is there the Bear Glacier. You get Stewart and Hyder at the end of the drive. 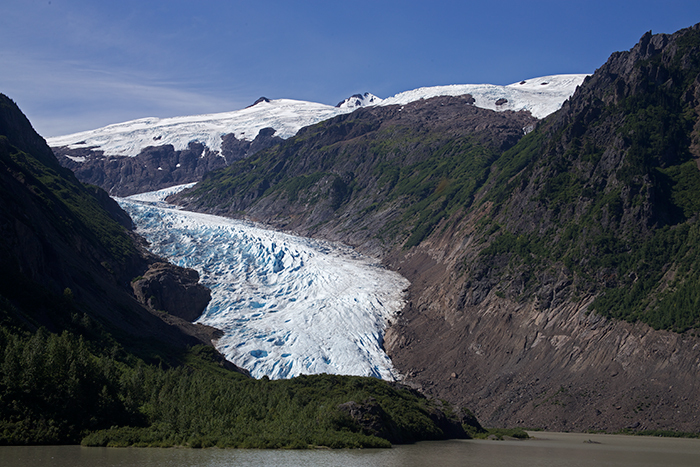 Bear Glacier is in substantial retreat, more than a thousand feet back from where WC saw it in 1993. The rocky peninsula in the foreground was half-buried in ice then. But it is still quite photogenic. The rest of the Stewart-Hyder Cutoff is equally spectacular. And the Bear River Canyon out does Keystone Canyon on the Richardson Highway. Unhappily, there are no pullouts for aspiring photographers. 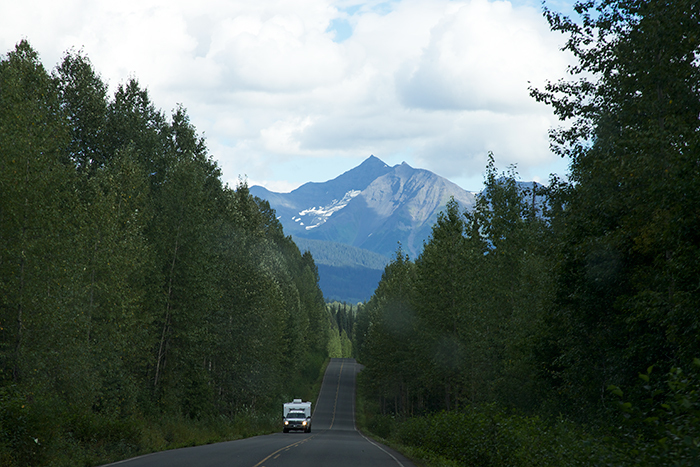 As the road winds through the Cassiar, Skeena and Coast Mountains, the scenery is spectacular. The Cassiar is now technically paved its entire length. “Technically paved” in the sense of the Dalton Highway to the North Slope being “technically paved.” The upper third is plagued with potholes, but there were repair crews and some construction as well. The Canadians are obsessive about maintaining roads. The Cassiar, especially the north half, reminds WC of the Alaska Highway 40 years ago, with long stretches of wilderness and very little commercial development. As a bonus, the Cassiar route cuts about 130 miles of the drive down the Alcan. At the north end of the Cassiar, WC recommends Nugget City, quite a nice lodge with cabins and an RV park. Pet friendly, too. Towards the south end, the excellent Meziadin Lake Provincial Park offers beautiful campsites in a developed campground, less than a hundred miles from the junction with the Yellowhead Highway. It’s true that the Cassiar makes you miss Liard Hot Springs. Everything involves a tradeoff. But the scenery is excellent compensation. It’s a very nice drive.